The modern way of shade sails 4u has a multiple sizes, shapes, colours and accessories available. Shade sails brisbane south Wellington Point speciliase also in shade residential, commercial and industrial shades structures. As a local family owned business, Shade Sails 4 U has been operating on the Gold Coast for 20 years. Servicing the Gold Coast, Redland Shire & Brisbane’s Redland Bayside & Logan City’s, Eastern Suburbs. Shade sails brisbane south Wellington Point Since shade sails first made their appearance at the Brisbane 1988 World Expo over 20 years ago, our company was one of the first on the Gold Coast to offer domestic shade sails to local home owner’s and small businesses. brisbane south Wellington Point have since evolved to become one of the most essential outdoor shade item in today’s family backyard areas. With advances in technology and a greater range of shade cloth fabrics, shade sails are now a familiar sight in many outdoor settings enhancing your family’s outdoor lifestyle. Contact Shade sails 4u at 0401 54 54 34 for free online quotes and more services of Shade sails brisbane south Wellington Point. Shade sails brisbane south Wellington Point over an industrial business entrance provide much needed shade but in a Bright or Fluro Colour, Shade Sail are a great form of advertising, catching the eye of potential new customers to your business. Providing Shaded Areas for staff to Relax or Perform Daily tasks while Protected from our Hot Sun. The ideal solution for Cafes, Carwashes, Staff Outdoor Lunch Areas, Smoking Zones, Yard Work Areas, Vehicle protection for Caryards. brisbane south Wellington Pointcan provide Today in many cafes & small restaurants have an outdoor alfresco dining area. Shade Sails 4U for your customers comfort whist having that long lunch gives them a cool oasis to sit under. 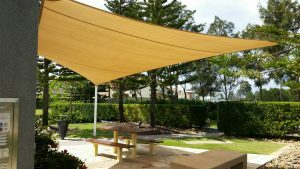 With the right design, Shade sails in brisbane south Wellington Point provide an excellent, and attractive shade alternative to keep your family cool and comfortable in hot weather by providing a cool shade oasis. Government Approved Shade Fabric for Ultra Violet Protection from the Suns Harmful Rays. Sails designed to provide protection and a cool environment suitable for work or play. Play equipment, Assembly Areas, Sandpits, Walkways, Handball. So choose our Shade sails brisbane south Wellington Point and carport shade sails in Brisbane.